Most people who support the Second Amendment have probably wondered at one time or another how to change the thinking of anti-gunners. Since I was once a staunch gun-control proponent, including being a member of Handgun Control Incorporated (HCI) in the 1970’s, but am today a fervent and virtually no-compromise Second Amendment supporter, perhaps the story of my mental shift will be of interest. When I recall my mindset in the 1960’s, when I was in college in Chicago, and in the early 1970’s, when I was teaching grade-school in a private school in Pennsylvania, what I remember most is how completely convinced I was that government was the best and ultimate answer to all of society’s ills — war, poverty, crime and injustice. I was a true Sixties liberal, who protested the Vietnam War, sported a “Question Authority” bumper sticker on my Volvo, who was a charter member of the National Organization for Women (NOW) and a charter subscriber to Ms Magazine. I voted for George McGovern. I hung out with other earnest liberals, many of whom were also members of NOW. It wasn’t that I believed government was perfect — far from it! — but I had blind faith that, with enough effort and money, it could be made so. My idea of a perfect government was one which had a generous welfare program, free medical care for all, lots of benign and helpful social programs, and government-mandated fairness and equality for all. I joined NOW because it promised to fight for equality under the law for women; it encouraged women to empower themselves, and to be independent. Since I was a single woman, these all sounded like sensible ideas to me. I joined HCI because it had convinced me that guns were a root cause of violence and crime, and that only criminals owned and used them. I had grown up stationed with my family overseas, and had been sent to private boarding school in Honolulu, where my family is from, and then to Chatham Hall, a young ladies’ “finishing school” in Virginia. Most of my life had been protected and privileged; while my family didn’t have a lot of money, we somehow gave the illusion that we did, since we lived overseas, complete with servants and first-class travel paid for by my father’s company. I had been raised, as my mother puts it, “to be a lady,” and certainly “ladies” in our social circle weren’t trained in self-defense, particularly self-defense involving firearms, which, in any case, were completely banned in the countries where we lived. After graduating from Northwestern, and doing graduate work at Lehigh, I got a job teaching 6th grade at a private day school in Pennsylvania, where I stayed for 10 years, during which time I was an earnest and unwavering liberal. After ten years of teaching, I was still making very little money, and had burned out. I decided to move back to Hawaii, which was my home, and where my parents had retired after 25 years of being stationed overseas, and purchase a franchise of a skin-care and cosmetic business, whose products were sold through home shows. I spent five ghastly years in Honolulu, struggling to run a business in a government climate which was as socialistic and larded with welfare and social programs as any I had previously worked towards; those five years were the undoing of my liberalism. I tried in vain to recruit women who were on welfare to work to do home shows and make money by being independent, but I could in no way compete with the obscenely generous welfare benefits they were receiving for staying home and doing nothing, except in many cases growing pakalolo, (marijuana) which they had plenty of time to do, since all of their needs were more than being met by the state. The Hawaii State Labor board delivered the final death blow to my business by declaring that all of the independent contractors who worked for my company — and whom I could hardly convince to work at all — were to be classified as “employees,” and that I had to pay unemployment, workers’ compensation and health care for them. The government cared not a whit that there was no money in my company to fund this state-mandated largess. I was forced to close down the business, to file bankruptcy, and I moved back to the Mainland, my formerly liberal tail between my legs, a newly-hatched libertarian conservative. I no longer saw government as the solution to social problems. It certainly hadn’t solved mine, nor had it encouraged my trying to create jobs for the people of Hawaii, jobs which they didn’t want to do because it was too much work, even though the Honolulu Star Bulletin was filled almost every week with whining letters from people complaining that there were no jobs to be had, and imploring the government to “create” more jobs. With the fervor and passion I had previously reserved for trying to get the government to expand its powers and programs, I began to read the writings of conservative and libertarian authors — Bastiat, Hayek, Thomas Sowell and others. I also plunged into the writings of the founders of America — Jefferson, Franklin, Madison, Paine, George Mason. I started meeting people who had also been abused by government agencies — the police, Customs, DEA, IRS and others. I started hearing stories of people having property seized without due process, and of people calling 911 and not having the police not show up in time. But the pivotal turning point for me was the Los Angeles riots. I was living in Orange County at the time, but had to go up to LA regularly on business. At that time there had been a rash of violent car-jackings, many of them committed against women who were driving alone. A friend, who knew a great deal about guns and had grown up around them, told me that, because I was a woman living and driving alone, he wanted me to start carrying a pistol in my car. He lent me a .38 Special, and showed me how to load, unload and fire it. One day, just before the riots exploded, I was driving in downtown LA in a scary part of town. It was dusk. As I was stopped at a stop-light, with one car in front of me, two men who had been watching me began quickly and menacingly approaching my car from the sidewalk. One of them was carrying a tire iron. I grabbed the pistol, which I had laid on the seat beside me, and held it up so they could see it. The look in their eyes changed in an instant from threatening to fearful, and they immediately turned around and ran in the opposite direction. The light changed. I drove away. No one was hurt, but a gun in my formerly liberal hand had, I believe, probably saved my life, or at least prevented me from likely injury. Within a week, the very street where this incident happened had erupted in rioting, looting and killing. I watched on television as the Korean grocers defended their property with AK-47’s and AR-15’s, and thus prevented it from being torched and looted. The police couldn’t stop the violence and killing. I had friends who worked in the garment district in LA who barely made it out alive, and who told tales of pulling out pistols and having would-be attackers turn tail and run away. Guns were saving lives and property. As the riots threatened to spill over into Beverly Hills, myriad Hollywood types stormed gun stores to arm themselves, only to be told that there was a 15-day waiting period; radio talk shows boiled with people calling in and screaming about how unfair this was, and how the law was leaving them helpless. Some of them even admitted that they had previously supported the waiting period, and that they were now furious that it had left them unarmed. My transformation was complete. I joined the National Rifle Association (I didn’t know about Gun Owners of America or Jews for the Preservation of Firearms Ownership yet) and started reading their literature. I bought and read “Armed and Female” by Paxton Quigley — another ex-gun-control woman. I fell in love with and married the friend who had lent me the .38 Special, and started learning in earnest about guns and how to use them. We joined GOA and JPFO. And the National Organization for Women? Here’s the thing that makes me crazy about an organization ostensibly dedicated to the empowerment of women — NOW is uncompromisingly and adamantly anti-gun, including urging all women to disarm themselves, and supporting legislation to force their disarmament. The incongruity and hypocrisy of this stance is simply stunning. 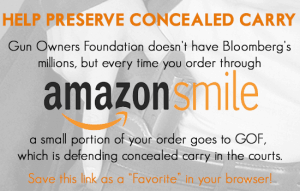 How can such an organization claim to be “for women?” In my experience as a single woman, there is nothing more effective than a gun for protection. In my experience as a married woman, when my husband can’t be there to pull out a firearm to protect us and our home, he has made sure that I can do so. What could be more empowering and independent and equalizing for a woman than that? And what could be more threatening to women than women like Sarah Brady, Barbara Boxer, Diane Feinstein, Carolyn McCarthy and Barbra Streisand who, while beating the drum for “women’s rights” are attempting to disarm women as well as men, and leave them at the mercy of criminals? I still believe fervently in the original NOW position supporting the empowerment of women. And I believe that the most effective thing any woman can do to empower herself is to acquire and learn to use a gun, and to become vocal and aggressive in defending gun rights and the Second Amendment. When I look back on my mindset when I supported gun control, I see that I was naïve, idealistic and swayed by irrational, baseless propaganda, especially the absurd myth that, by disarming law-abiding citizens, society will be made safer. There is absolutely no hard evidence to support this. Criminals by definition disregard laws, especially gun control laws. In Australia, which has disarmed its population, it is reported that violent home invasions have increased in some areas by 44%. Rapes and murders have also increased substantially. In being confronted by the reality that government cannot and will not guarantee my personal safety, I am infinitely thankful, both as a woman and an American, that the Bill of Rights still guarantees my right to defend myself with a gun. Any true feminist must support this position. Any woman who claims to be a feminist, but who supports disarmament of law-abiding citizens is simply a dangerous hypocrite. Katherine von Tour is presently working on a book comprised of interviews of women who support the Second Amendment; she is looking for women who have personal stories about having used a gun for self-defense, or who simply believe in the right to own and use a firearm. Anyone wishing to be interviewed for this project can contact her through GOA.